Basically the only things not included were the extras, like the excursions. Thanks to the great suggestions here, we had decided to use Honeyfund as a registry for our wedding gifts, and the excursions were part of these. Thank you to all of our great family and friends who made them possible, we had a blast! Now C is a "relax on the beach" kind of guy and I am a "can't sit down" kind of girl, so we compromised by having one day of relaxing and then a day or half-day of activities. Our first excursion was a trip out to the coast to the whales and dolphins. It was a beautiful day and we saw all kinds of beautiful scenery as we floated along the coastline. The dolphins were so awesome and playful, jumping around and racing our boat. I've never really understood the appeal of dolphins before, but after this trip and seeing how intelligent they are, I would definitely do a "swim with the dolphins" kind of thing next time. We had lunch at the beautiful Marigot Bay and visited the resort where the original Dr Doolittle was filmed. This particular bay is known as a haven on the island because it's a double bay, ie on a windy day as you can see above, the waves are spectacular but they break on the first bay, leaving the second bay calm as can be. Which is why during hurricane season many boats come to dock there. See that rope? I'm trying to shake the tree and pull down a coconut! As a side note, Marigot Bay was also a favorite hideout of the Brits during their many battles with the French because the masts of their boats were hidden by the palm trees on the first bay, so they could just hang out there unseen until the French boats passed. Next up, was a volcano and rain forest tour for me. C wasn't that interested in seeing a volcano (it was the world's only drive-in volcano, come on! ), and we have a policy of not forcing one another to participate in activities we're not interested, so I went alone. I cannot even tell you the number of people who found this bizarre. So much so that our tour guide actually turned the bus around because she was sure that we'd forgotten him. I tried to explain that he didn't want to come and why should we pay extra for him to sit and be miserable all day instead of doing something he wanted to do, but she couldn't understand it and eventually ended up calling us "modern". And another couple made jokes about us being in a fight. We may be newly married, but we don't have to be attached at the hip 24/7. At least this way, we both did what we wanted to do and at the end of the day, we reunited and had a great time sharing our day. Even though this excursion was to see the volcano, since it was on the other end of the island from our resort, we also saw a ton of other stuff along the way. We saw the beautiful Marigot Bay above, we stopped to get fresh coconut milk from a street vendor and we saw a guy with an 8-foot boa constrictor. And all along the way, our guide was telling us about the history of the island and each little town we passed. We finally got to the volcano and sure enough, we could drive right into it since it had imploded. After a while, we got out and had a guided tour of the rest. The volcano hasn't exploded for 300 years or so, and is overdue for another. Next up was a "Sugar and Rum Adventure". (Thanks Jpack and Milkjam!). Again, we had a really interesting time learning about the history of the island, and how it was prized for its sugar cane and tropical fruits. The above picture was of some of the local fruits, and we also got to try a cocoa nut - so different than what I was expecting (and slimy). We also drove through a banana plantation - did you know that banana trees only produced one time and then they die? I had no idea. It turns out it's a great crop for the St Lucians because that means they have trees at different stages of the growth cycle all year-round and thus have a continuous source of income. Plus if ever there's a disease, they don't loose all of their crop. The banana plantations came to be rather quickly, after the Brits realized they could grow and harvest sugar beets at a much cheaper rate than importing sugar cane from St Lucia. However this essentially wiped out their major industry and caused a stressful few years. They rebounded though with the bananas, export of fruit juices and oils, and of course rum! And after that, we were on to the good stuff, ie the rum tasting! As you can see on the table below, there were 19 different kinds of rum to be tried. I tried all of them except for the last one on the right. Hey, that's a lot of rum, and it was 180 proof! 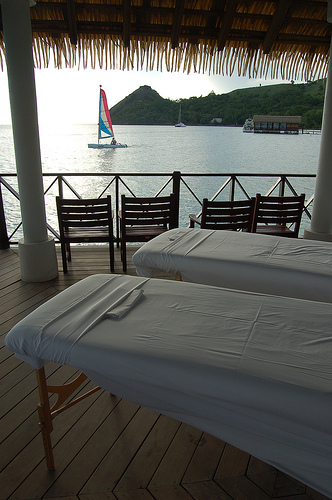 We also got a couple's massage, and it was FANTASTIC! C was a little nervous since it was his first time - and his eyes just about popped out of his head when his masseuse said "I hear you're a virgin", but I think he's a convert. On top of that (and the relaxing), we also did a lot of swimming, both in the water and in the pool, we went to the gym a few times to work off all those calories we were consuming and we did a few water activities. They actually had quite a list of them: canoeing, sailing, windsurfing, water tricycle, snorkeling, water skiing & knee boarding. We tried the water bike and canoeing, and C went windsurfing the day I visited the volcano. So not too bad for eight days and seven nights, huh? I really enjoyed myself in St Lucia - I didn't want to just be one of those tourists who goes to an island and then never leaves the resort, and I feel like the different trips we took really gave us a feel for the place and allowed us to learn so much about its history. The St Lucians were so friendly every where we went and many were just willing to talk and share - it wasn't at all like in Egypt or Tunisia where they are constantly harassing you. Sure everyone has something to sell here, but if you're not interested, you just say no politely and then you can just keep chatting with them no big deal. There were also people at the edge of the resorts hawking other excursions and jet skiing, but we didn't try any of those. But again they weren't pushy at all, and I did see a lot of people recommending using them on TripAdvisor. Hopefully this series has been useful for those considering a holiday in the Caribbean and/or an all-inclusive resort. We had a great time, I would definitely recommend Saint Lucia as a vacation destination if you're looking for a tropical island getaway! Certainly a holiday worth remembering, in a stunningly beautiful place. Sounds like it was a great honeymoon destination! I had to laugh when you wrote "I never really understood the appeal of dolphins before"...who DOESN'T love dolphins?? Going for a swim with them is on my list bucket list. Beautiful pics...glad you enjoyed it! P.S. Random fact I read in a "Ca m'intéresse" magazine one time...150 people per year are killed by coconuts falling from the tree onto their heads. Consider yourself lucky you made it out alive. You tried 18 different rums? Wow! it sure looks perfect to me. and i don't think it's weird at all that you did different things one day. when p-daddy and i were on our honeymoon we had a joke, 'what did you have for breakfast?' oh. yea. i had that too.' it's a long time of having the same breakfasts. and there's nothing like a fresh coconut with the top whacked off and filled with rum. happy honeymoon bliss. it never has to be over.